Being the somnonaut that I am, I have always been interested in trying to sleep in a R.E.S.T tank. While I was never convinced that I would emerge from the experience transformed into a short, hairy primitive being as in the 1980 William Hurt movie Altered States, I have always believed that the experience could be transformative. In 1953, neuroscientist John Lilly constructed the first sensory deprivation tank. This vessel was devised as a way to study the brain's response to limited sensory input. The tank immersed the user into a totally dark and silent environment in which sound and vision as well as other sensory inputs were virtually eliminated. The theory at the time was if all sensory inputs were cut off to the brain, the brain would reflexively go to sleep. Lilly, a self-described "psychonaut", used the tank to study these and other kinds of theories. Today, the study of sensory deprivation, or Restricted Environmental Stimulation Technique (R.E.S.T. ), has led to a more widespread use of these techniques to promote health and well-being. Float tanks have been around. As someone who deals with professional sports teams, they have been used sporadically by both college and professional teams since the early 1980's. Recently, members of both the New England Patriots and Seattle Seahawks utilized float tanks with their athletes. Their use has seen resurgence in popularity owning to their proclaimed abilities to promote relaxation, physical recovery, and pain relief. Every somnonaut needs a mission control, and AquaFloat in Charlottesville, VA filled that role perfectly. Owner and float expert Ted O'Neill met me at the facility the night of my experiment. I chose the 10 p.m. slot as I thought my chances of sleeping would be best. Slots were two hours long, but Ted does not like to interrupt a good float if nobody is signed up behind the floater. Ted was clearly excited to be a part of yet another maiden voyage. He was enthusiastic, but calm and professional. As a pharmacist who stumbled upon floating by chance, Ted's life was forever changed by the encounter. Put it this way: If Ted owned a corn farm, he would have plowed it up to build a baseball field. The facility was gorgeous. I expected a Spartan warehouse with industrial tanks scattered about. The aesthetics featured gentle sweeping architectural curves and local artists' sculptural interpretations of floating. I can definitely sleep here. After surveying the lounge, he led me to the various tanks, explaining their strengths and drawbacks. He was also careful to demonstrate the filtration systems servicing the tanks (as if something could live in an environment that is 25 percent Epsom salt!) That salt produces the magical buoyancy not unlike what you might see when tourists swim in the Great Salt Lake. "You are not going to sink," Ted said. "When you get into the tank, I want you to fully relax your head and neck. Release those muscles completely." Time to get into the tank. The tank had quiet lighting that was slowly changing color. "The light can be left on or turned off. " He strongly recommended dark. Likewise, the hood of the tank can be left open or closed. He suggested leaving the hood open slightly if I started to feel to warm during the float. The room was dark enough that cracking the hood open a bit would not make a difference in terms of light. "Do I wear a swimsuit?" I asked, shorts in hand. He shook his head. "Naked. It's the only way." After a quick shower, I ventured into the tank. The temperature was perfect. Not hot, not cool. Perfectly comfortable. It was so on point that the water almost disappeared. As I lay back, I floated effortlessly. I stretched my head backwards to the point of my eyes almost being in the water, and then let gravity slowly relax me to a neutral position. This is so easy. I loved it immediately. With the hood down, it was time to cut the light. Immediately I was swallowed by a dense darkness. Floating there, I became aware of my first obstacle. What in the world am I supposed to do with my arms? Initially I had them down by my sides, but found that they kept floating around like pieces of driftwood. As my thumbs bumped into my legs, the floating experience was diminished. I quickly assumed the "robbery-hands-over-my-head" position and found it to be much more pleasant. Within minutes of my positional decision and a quick mental toe to scalp muscle survey, I was floating...REALLY floating, and to borrow a phrase from Bowie, "in a most peculiar way." Unusual experiences quickly followed. My first was an intense sensation of being pulled upward. Imagine a cord being attached to your abdomen at a point where you would be perfectly horizontally balanced. Now imagine that cord being rapidly pulled upward. The experience reminded me of the unknowing sleeper being pulled up into the UFO from the comfort of his bed. Maybe that sensation underlies the feeling people have recounting UFO abductions? What accounts for the subsequent sensation of being probed, I have no idea. As the feeling of upward motion continued, I started to feel as if I was moving within an infinite space. 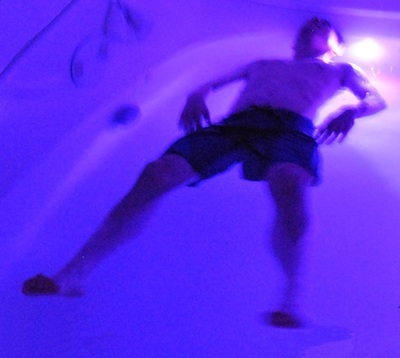 An individual preparing to float for the first time might be anxious about claustrophobia. My sensation was exactly the opposite. I felt a sensation of endless space around me, like the drifting disconnected astronaut in 2001 as he floats silently away from the spaceship and HAL. As I worked to adjust to sensations I frankly was not prepared for, I began to focus on my task at hand: sleeping. Sleeping is not typically the goal during the actual float. That said, many people who regularly float report significant sleep improvements after the float. I worked to clear my mind, although I was instructed to simply let my thoughts flow and perhaps try watching them from afar. As I became more accustomed to the physical nothingness I was within, the state began to seep into my brain. I was relaxed and at times felt nothing. Suddenly soft colored lights came on. My first emotion was annoyance. Can somebody here not figure out how to set a two hour timer? As I reached for a towel hanging to my right so I could wipe some water off of my face, I became aware of how laborious it was to perform a simple movement. It felt awful. My body did not want to engage the muscles of my arm and back and was pointedly letting me know. Pushing through the resistance, I reached for the non-existent towel. In the soft purple light, I searched for it (without my glasses) and found nothing. Had it fallen in the water? In my search I found the towel hanging to my left. I grabbed it, and tried to push the lid of the pod open to exit the tank so I could find Ted and tell him to fix the timer. At that point I realized I was sitting backwards in the tank. The hatch was behind me. I had turned 180 degrees in the tank. I gracelessly turned my body around which had the coordination of a wobbly toddler, opened the hatch and stepped out. "I hate being upright," my brain whispered to me in a bitchy voice as I looked for my watch. As I showered and dressed, thoughts were racing as my body once again reassumed the burden of gravity similar to Atlas being tricked into bearing the weight of the world again by Hercules. Walking out into the lounge for tea, Ted was ready to listen and explain. Everything I mentioned he accepted with a knowing curiosity. He's heard these stories before. Did I sleep? Under no circumstances do I feel like I slept in the tank. However, it was very clear that I lost tremendous chunks of time in the tank. It did not feel like two hours. As a sleep specialist, one phenomenon that never ceases to amaze me is how much individuals with sleep problems can radically underestimate how much they are sleeping at night. People who sleep hours at night can truly feel that they are awake and conscious for the entire duration of their slumber period. It is not a fun way to spend a night. This twilight sleep (now called paradoxical insomnia) is a common issue among my patients. "Promise me you'll come back. You've just scratched the surface. It gets much better." I felt the effects of the session for days. Even my wife said I looked different when I came home that night. I felt like a cooked noodle. While I have not returned as of writing this article, I think it's only a matter of time before the weight of my clinical practice, raising three kids, flying around the country trying to help athletes sleep better lead me to dash out the door for a float. I can almost hear my wife calling after me, "Don't you need a swimsuit?" "Nope. Naked is the only way!"